Haad Yuan on the island of Koh Phangan in Thailand is a good example of how there’s much more to the sizable island than only the famous Full Moon Parties. Situated one beach north of Haad Rin Nok, the beach at Haad Yuan is more picturesque and just as nice for swimming. The atmosphere is certainly more relaxed and less geared toward a rambunctious party scene. That said, Haad Yuan does hosts its own famous EDM party, the Eden Party, every Tuesday and Saturday. Haad Yuan is a small bay and beach located on the southeastern side of Koh Phangan, a sizable island part of the Samui Archipelago in the Gulf of Thailand. Haad Yuan is 15 minutes by longtail boat to the north of Haad Rin Nok, venue for the monthly Full Moon Parties. Haad Thian, a much smaller beach and home to The Sanctuary — a popular yoga and health resort — is located one stop north of Haad Yuan. If scrambling over stairs carved into stone aren’t a problem for you, you can walk between Haad Yuan and Haad Thian in around 20 minutes. Haad Yuan can be navigated entirely on foot along the beach; unlike Haad Rin, there are no roads. Walking to breakfast on the beach without dodging backpackers on rental scooters is part of the charm and appeal of Haad Yuan. With wooden walkways perched on rocks at each end of the beach, lots of magical views and secret little spots await. The northern end of Haad Yuan is the busiest, with a system of rock ledges and wooden walkways that lead to popular spots such as the Eden Bar along the way to Haad Thian. Prices for water, beer, and other items are slightly higher in Haad Yuan than in Haad Rin. Bring what you need with you to the beach. A couple of small minimarts in Haad Yuan stock some basic beach necessities. There are no ATMs in Haad Yuan or Haad Thien. Credit cards are rarely useful — bring enough cash so that you don't have to take the overpriced taxi boats back and forth to get money. Reliable Wi-Fi can be difficult to find in Haad Yuan; most people rely on mobile phone data plans instead. Some resorts offer Wi-Fi access for a fee. AIS has better phone reception than the other local phone carriers. Although Haad Yuan is removed from much of the party scene found in Haad Rin, it isn’t entirely quiet. People flock to Eden Bar on Tuesdays and Saturdays for thumping EDM parties. The longtail speedboats to Haad Yuan can be a rough ride on choppy seas. Be prepared to get a little wet! There is no pier, so you’ll be in knee-deep water when getting in and out of the boats. Pack and waterproof luggage accordingly. The swimming at Haad Yuan is comparative to that at Haad Rin, however, both are home to black urchins. If stepped on, the spines can be difficult to remove and may cause infections. Take care when walking over submerged rocks. Haad Yuan is small and accommodation fills up quickly during Thailand’s peak season (between November and April) — particularly in the months between December and February. Paying for a taxi boat only to drag your luggage around the beach and find out that there are no rooms left isn’t fun at all! Many bungalow operations in Haad Yuan are so busy that they don’t even accept reservations in advance during the busy season. You’ll simply have to turn up and see what’s available. Making a few phone calls from Haad Rin before going over is the best way to ensure that you’ll find a room. Some of the most popular accommodation options are Bamboo Hut, Big Blue, and Barcelona Resort. Prices fluctuate widely based on demand. The Eden parties are held on the rocks at the northern end of Haad Yuan. The noise can be heard all along the beach, however, Bamboo Hut is nearest the action and will be loudest option. Barcelona Resort is farther away; look for options in that area if you're worried about the noise. Note: Sadly, because travelers must keep larger amounts of cash with them due to the lack of ATM, room theft can be an issue in Haad Yuan. Small amounts of money are taken from rooms (e.g., one 1,000-baht note from a money belt) in hopes that travelers won't bother reporting the loss. Find a way to hide (not under the mattress) or lock up your cash. Perched on the rocks between Haad Yuan and Haad Thian, you’ll find Bamboo Hut — a popular bungalow operation with an excellent restaurant. Along with great views of the beach and generous food portions, Bamboo Hut's prominent location allows for better phone and Wi-Fi access. Many people visiting Haad Yuan make the trek over the rocks to eat at The Sanctuary’s excellent beach restaurant. Eden Garden, located on the rocks beyond Bamboo Hut, is the place to party with weekly electronic-music parties. When nothing is happening in Eden Garden, you’ll find a couple reggae bars and other chilled-out watering holes in Haad Yuan. 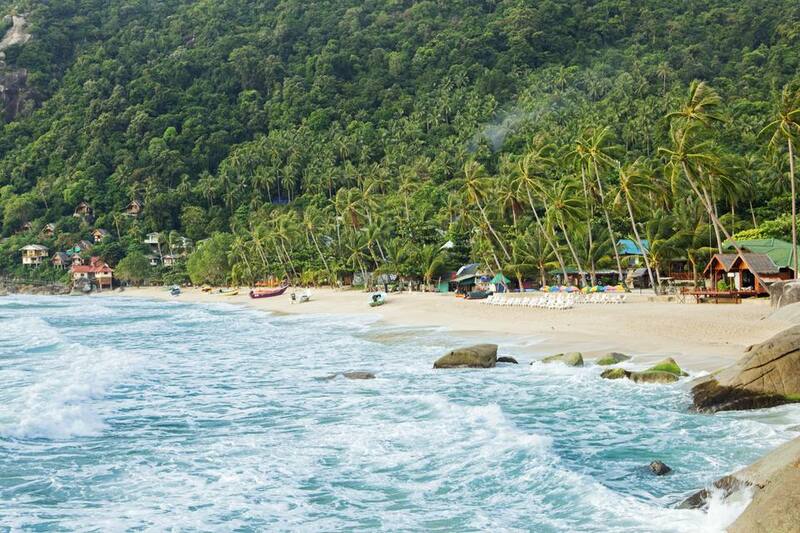 Get to Koh Phangan: For starters, you’ll have to get yourself to the island of Koh Phangan. Flights can be booked to Surat Thani (airport code: URT). If time is more an issue than budget, fly to the neighboring island of Koh Samui (airport code: USM) then grab a boat from the airport to Haad Rin beach, the beach nearest to Haad Yuan. There are several options for getting to Koh Phangan from Chiang Mai. Go to Haad Yuan by Road: There is a road across the island to both Haad Yuan and Haad Thian, although it’s bumpy and winding. The road sometimes becomes too rutted and washed out during the rainy season for passage. Ask in Thong Sala — the port town — about a songthaew or private taxi to Haad Yuan; going overland may or may not be an option. Go to Haad Yuan by Boat: The default way to reach Haad Yuan is by speedboat from Haad Rin — the busiest beach on Koh Phangan. Begin by taking a songthaew truck from Thong Sala to Haad Rin. Prices are fixed at 100 baht one way; ask for the "sunrise beach" (Haad Rin Nok). Walk out onto the beach and you’ll probably be immediately approached by taxi boatmen. You’ll need to wade out a little to board the boat; plan to get wet. Boat prices were increased in 2015 and are fixed at 300 baht a person to both Haad Yuan and Haad Thian. Given that the journey is only 15 minutes, these prices are very steep by local standards. A local "mafia" ensures you won't find a cheaper ride or be able to easily negotiate the fare. Tip: If you’re bound for The Sanctuary, ask the boatman to take you to Haad Thian instead. The path between Haad Yuan and Haad Thien is tricky to navigate with luggage. For the same price (300 baht), you can be dropped directly at The Sanctuary. Although Haad Yuan is usually more serene than Haad Rin, the weekly parties at Eden Garden have exploded in popularity. Parties are held at the far northern end of the beach, however, the thumping electronic music can be heard everywhere each Tuesday and Saturday night. Parties literally last all night and into the next morning. If you're worried about noise, either avoid Haad Yuan on Tuesdays and Saturdays (you could walk over to the Sanctuary) or stay as near the southern end of the beach as possible. Revelers at the Eden Parties go for the mind-altering substances more than alcohol. Weed, hallucinogenics, and MDMA can be purchased somewhat easily. substances can be of questionable quality. Although medicinal marijuana was legalized in Thailand in May 2018, tourists who get caught with any amount of illegal drugs are subject to imprisonment. The local police are renowned for requesting steep bribes — don't risk it!